Please, please, PLEASE tell me I’m not the only one with glasses that look like this! I opened my cupboard the other day and I couldn’t find a single “clean” glass in there! Now, I know they are clean. They went through the dishwasher, at least. But every time they went through a cycle in there, they came out a little bit worse. So how do you get cloudy glassware all shiny and clean again? It’s easier than you may think! How to Shine Cloudy Glassware: Vinegar. It’s like the “cure-all” for home cleaning projects! If you have a lot of glassware to shine, I would suggest letting them soak first in a mixture of one part water to one part white vinegar. After soaking for a while, scrub with a soft rag and the calcium deposits and water spots should wipe right off. If you are just cleaning one or two glasses, then dip the corner of a soft rag in straight white vinegar and rub. A little elbow grease will do the trick. It took me less than five minutes to get this glass clean and shiny again. Look at the difference! There are a couple ways to keep your glasses from getting cloudy again after cleaning them up. Hard water leaves deposits, and leaving the dishwasher on Heat Dry will just cook them on. So use a good rinsing agent in the dishwasher and then set it to Air Dry instead of using the heat. It also pays to spend a little more and get a good quality dishwashing detergent. After seeing it so many times in the comments, I finally got a bottle of Lemi Shine detergent booster. Let me tell you, this stuff is AMAZING. I still had to clean the worst of the hard water stains off by hand, but now I can keep them off for good! I was stunned by how clean the inside of my dishwasher was after one wash with the detergent booster! This is one of those products that’s absolutely, totally and completely worth the money. I have tried all sorts of different cleaning tips and tricks that float around Pinterest. This post was one that I did right after I reached Day 365 and is a collection of some of my favorites. 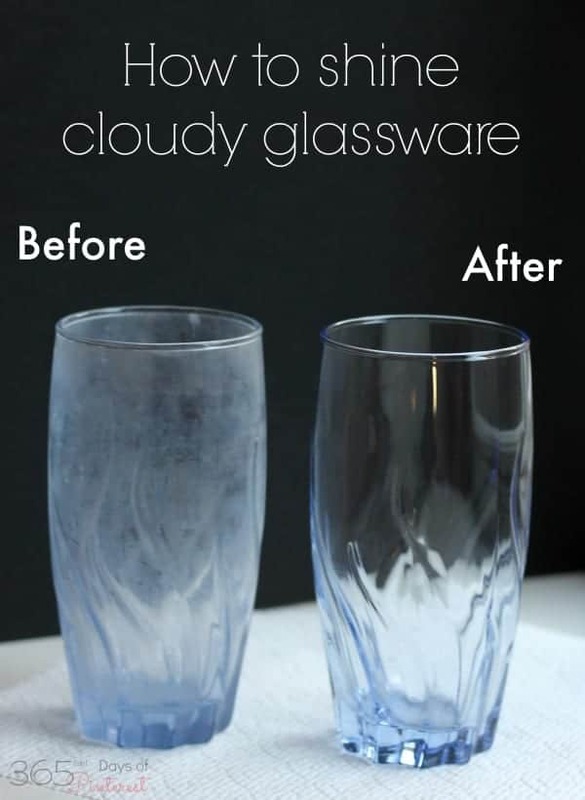 You can bet this post for making cloudy glasses shiny again will be in my next collection! Loved your post! Very helpful. We barely use any soap at all- I did just what you’re suggesting after getting the dishwasher serviced a few years ago. The technician told us the same thing. The main culprit in our area is hard water. using vinegar in your dishwasher or washing machine will damage the gaskets in the machine. Once in a while would be OK I guess but on a regular basis will really harm your machine. I’ve never tried vinegar, but I will now…What I’ve used for years for stains like this, or especially to clean dull crystal or cut glass, is denture tablets. Don’t waste your money on the brand name stuff, the dollar store stuff works better. Put a cloth on the bottom of your sink, put the stuff you want to clean on the cloth, cover with hot water. Drop some tablets in and let soak while you do something else. Rinse well and dry with paper towels. Sparkling glass with very little work! Also works really well for bud vases or anything with a small opening. That is a great idea, especially for the small-necked vases! It also depends on how long your glasses have been like this. The correct name is etching. The reason that it happens is because if you have hard water, the hot water and heat of the dishwasher burns those minerals into the glass. You can definitely soak in a 50/50 mixture of vinegar and water. But if it’s been years….it may not be able to correct the damage. 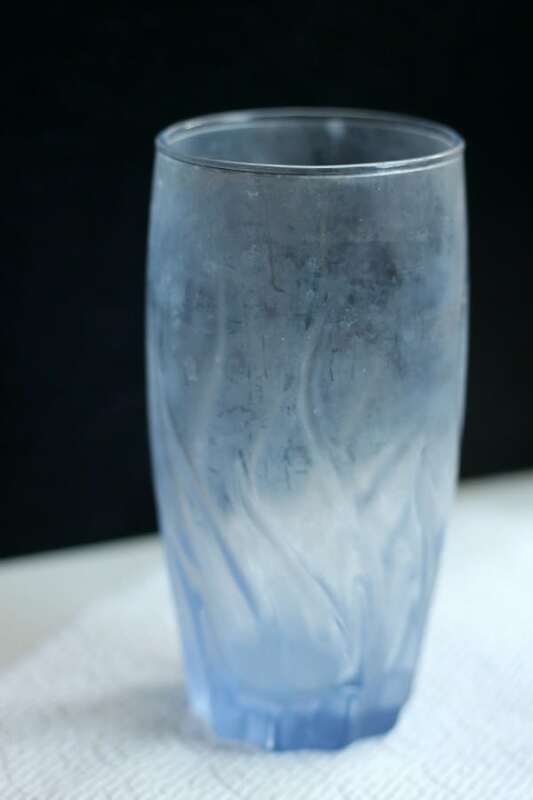 If you have hard water, we usually suggest that you hand wash your glasses (yuck!) or avoid the highest heat/hot water temp on the dishwasher. I’ve turned off the heat in my dishwasher to keep my glasses from getting worse. The ones that I’ve buffed with vinegar look great and are shiny again. The ones I haven’t done yet still look pretty awful. 🙂 I need to soak them so I can get a larger batch done at once. I did start adding vinegar to the spot where you would add rinse agent (like Jet dry) and that has made a big difference on all my dishes! And then there are coffee and tea stains in cups, wonder if vinegar would work on them? My cousin put a quarter cup of clorox in the bottom of the dishwasher and that did the trick. I have hard water and my glasses and silverware were bad. Now I just dump a bit of vinegar in the bottom of the dishwasher and use regular detergent. No need for a special rinse agent. My glasses are beautiful. That sounds great, but what does “dump the vinegar” mean? Where exactly, and how much? Or does it matter? So excited = so many questions. I pour white vinegar in the rinse agent reservoir. When the indicator says it’s time to refill, I add more vinegar. I hope this helps! I just discovered your blog, and I am enjoying it. However, I was disappointed to see that someone who claims to love “good grammar” has many examples of incorrect grammar in her writing – including a run-on sentence in the opening paragraph of this post! I’m certainly not perfect either, but having declared your love of grammar to the world, you need to be! 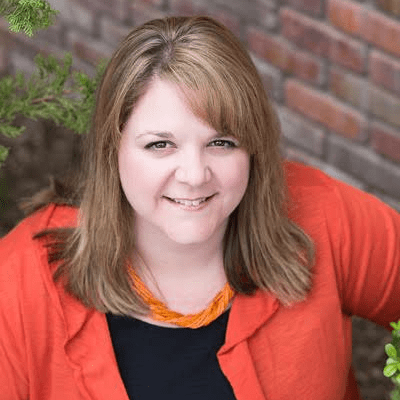 In an effort to be friendly and approachable, I choose to write my blog as if I am speaking to a friend. I write in a casual, conversational style. If I planned to write a research paper, my “voice” would be much more formal. I appreciate when people take care to spell commonly misspelled words correctly, use the correct “two, too, or to” and bother with punctuation. However, that does not mean that I will always be perfect, nor do I claim to be. I hope you find many useful tips and recipes to enjoy on my site-even if they aren’t perfect. Your name is “Cad” for a reason, get off your high horse and get a life! Your a jerk. If you have a problem with her blog get off of it, you big jerk!! I used to have this problem. I then started adding about 1/4 cup of white vinegar to the bottom of the dishwasher when I ran it. Adding the vinegar to the dishwasher will keep this from happening again and will slowly remove the build-up on the glasses. Been doing this for months now, it really works. We use Lemi Shine in with our detergent and it is AMAZING. 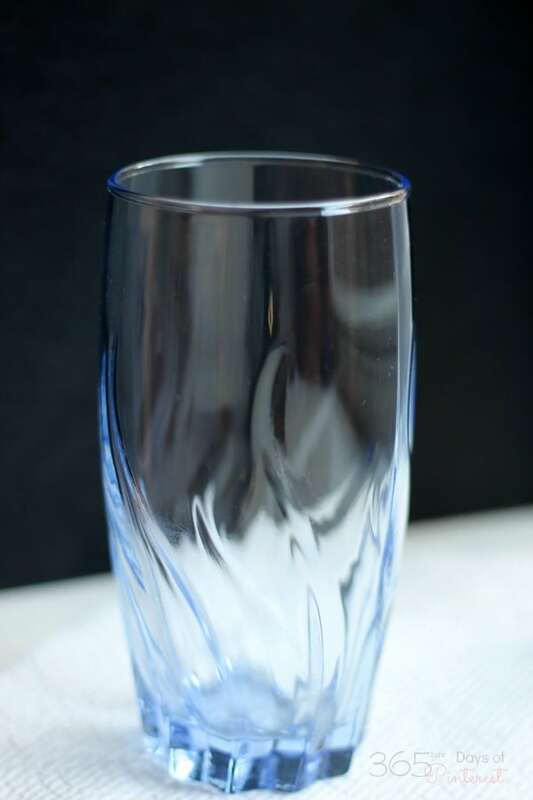 We have super hard well water and our glasses always come out sparkling and clear. Try it and it will amaze! We had glasses just like you show above!